Milk chocolate buttercream frosting is the perfect chocolate lover’s topping for any cake, cupcake, or brownie. It’s light, fluffy, and so irresistibly delicious, you can skip the cake and eat it right off of a spoon! I’ve been dreaming about milk chocolate buttercream since I first whipped up that White Chocolate Buttercream for Son #1′s birthday last year. The kid loves white chocolate, so I had to come up with something special just for him. 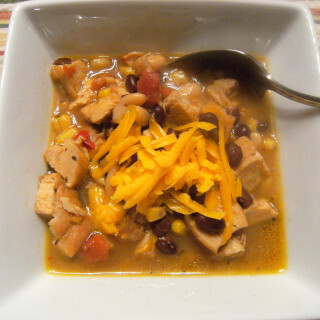 I had no idea that the recipe would become the most sought after recipe on my blog. Who knew? Popularity aside, I am a steadfast Milk Chocolate Girl. I just love the stuff! So much so, that I always have at least one 6-pack of Hershey’s bars in the house in case of emergencies. The satisfying simplicity of milk chocolate can’t be beaten with a stick, I tell ya! I should know, because I ate many a wooden spoonful of milk chocolate buttercream during the recipe development process. This frosting is so light and creamy that it’s practically like eating a bowl full of chocolate mousse. Not that I ate an entire bowl of frosting or anything…although the thought did cross my mind. But I highly recommend frosting your favorite cupcakes with the Milk Chocolate Buttercream instead–it just seems a bit more…reasonable. unsalted butter, four regular Hershey’s Milk Chocolate Bars, vanilla, heavy whipping cream, and powdered sugar. Baking chocolate is fine, but under no circumstances should you use milk chocolate chips or candy melts. The same waxy coating/additives that help the chips/melts retain their shape while baking, and give it sheen after being melted/cooled, will do weird things to the frosting. Clumpy, hard bits in the middle of your otherwise creamy and wonderful frosting can ruin things. Ergo, wax in food = Bad. Break up the chocolate and place it into a microwave safe bowl. Heat the chocolate in a microwave in 30 second increments on full power, stirring well in between each burst, until chocolate is melted and smooth. Allow the chocolate to cool. 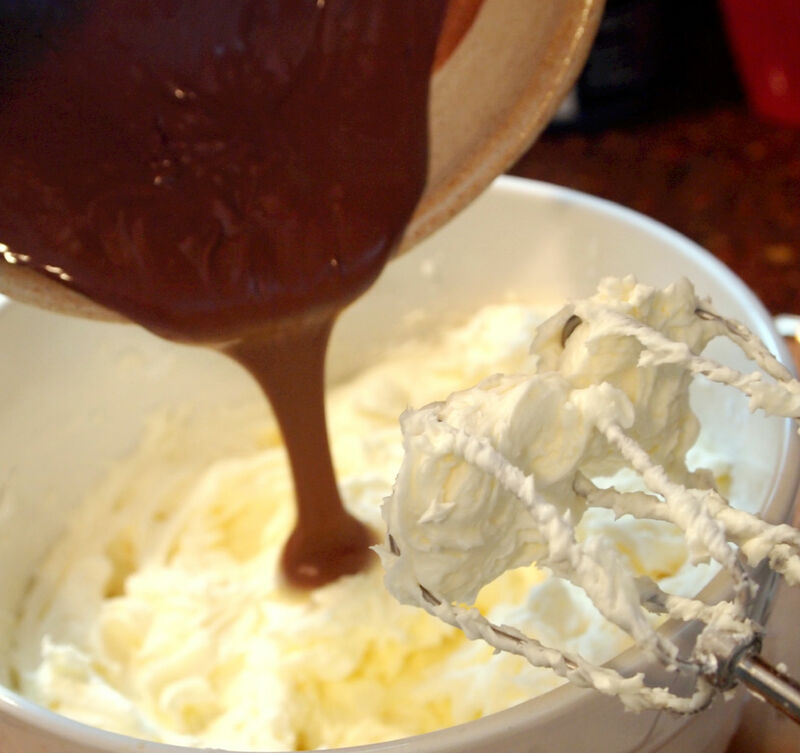 Once the melted milk chocolate is cool to the touch, sift the powdered sugar over the butter, and cream with a hand mixer until it’s nice and fluffy. and mix on medium speed for 2 to 3 minutes, or until it’s really fluffy. At this point the whipped cream frosting is quite delicious and would be lovely on any cake. I’d be lying if I didn’t tell you that I considered frosting the cupcakes at this stage, and make a meal out of dipping everything I could find in the melted milk chocolate. BUT! My conscience got the best of me, so I poured all that luscious melted milk chocolate to the mix, and mixed it in on low speed for about a minute, until it was all incorporated. Since I’m apparently all about full-disclosure today, I should also tell you that I ate a spoonful of this loveliness straight from the bowl. OK…two spoonfuls. And I’d do it again, too! It’s so light and heavenly! Pipe the frosting on top cupcakes, a sheet cake, or layer cake. 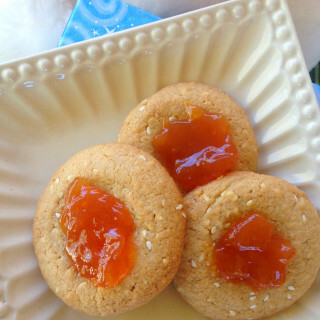 Use it as a filling for sandwich cookies–the possibilities are endless! Whatever you do, be sure garnish with sprinkles because sprinkles make the world a happier place. If you are not going to serve the frosted cake(s) right away, store it in an airtight container in the refrigerator. Allow to sit out at room temperature for 30 minutes before serving. Milk chocolate buttercream is a very soft and creamy frosting. Fluffy, decadent real milk chocolate buttercream is a dreamy buttercream for filling and frosting cakes and cupcakes. Put the chopped milk chocolate bars into a small bowl. Heat the chocolate in 30 second increments in the microwave set to 60% power. 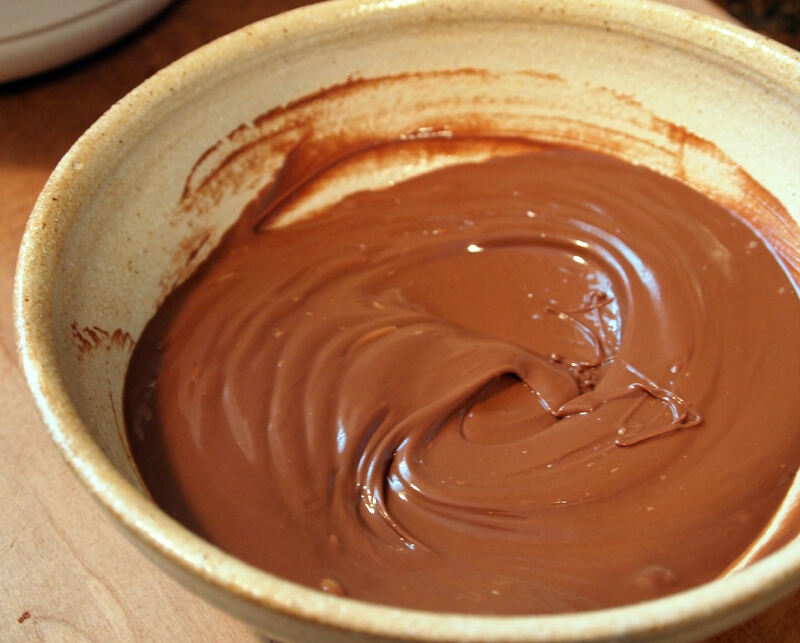 Stir after each increment, and continue to heat 30 seconds at a time, until the chocolate is melted and smooth. Set aside and allow to completely cool. Once the milk chocolate has cooled, sift the powdered sugar over the butter, in a large bowl. 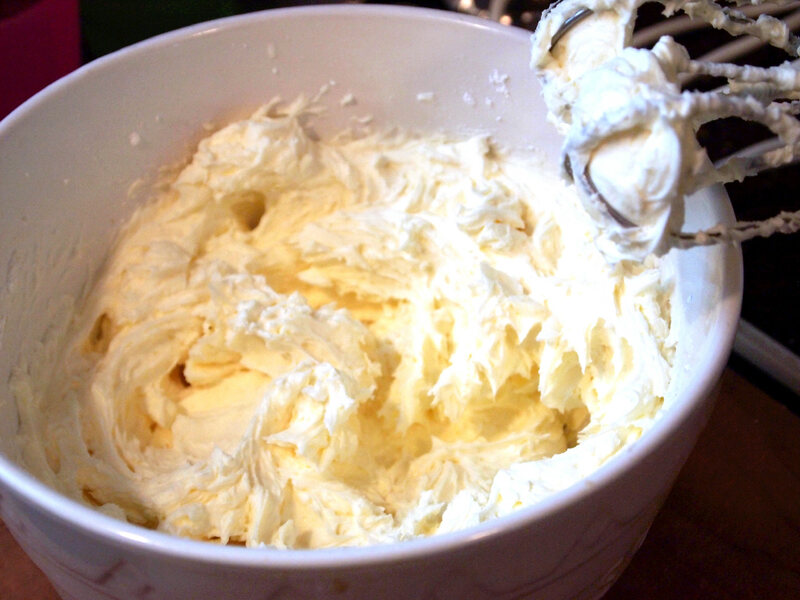 Cream the butter and sugar together until light and fluffy, scraping the sides of the bowl as needed. Measure the whipping cream into a cup, and stir in the vanilla extract into the cream. 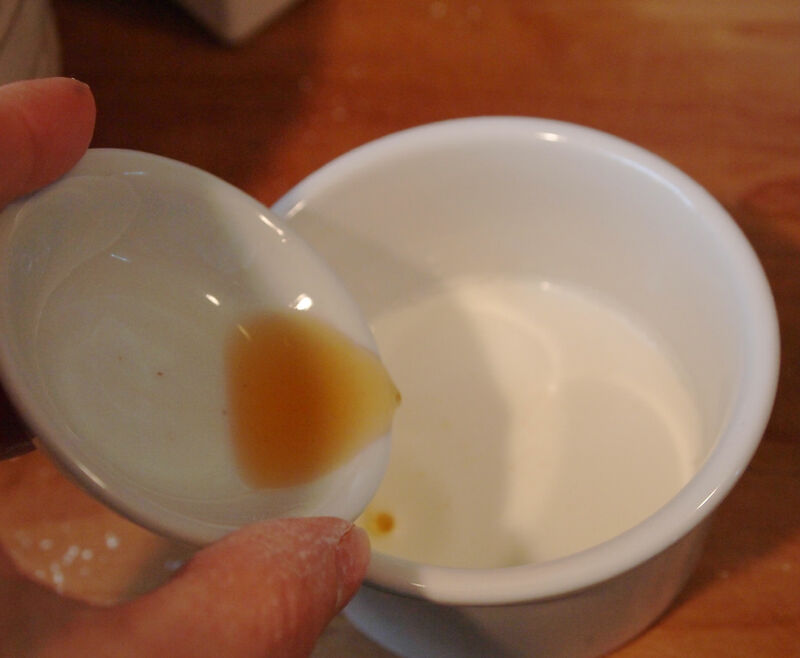 With the mixer running on low speed, gradually pour the cream mixture the bowl. Once the cream mixture has been incorporated into the frosting, fold on the melted (but cooled) milk chocolate until incorporated. 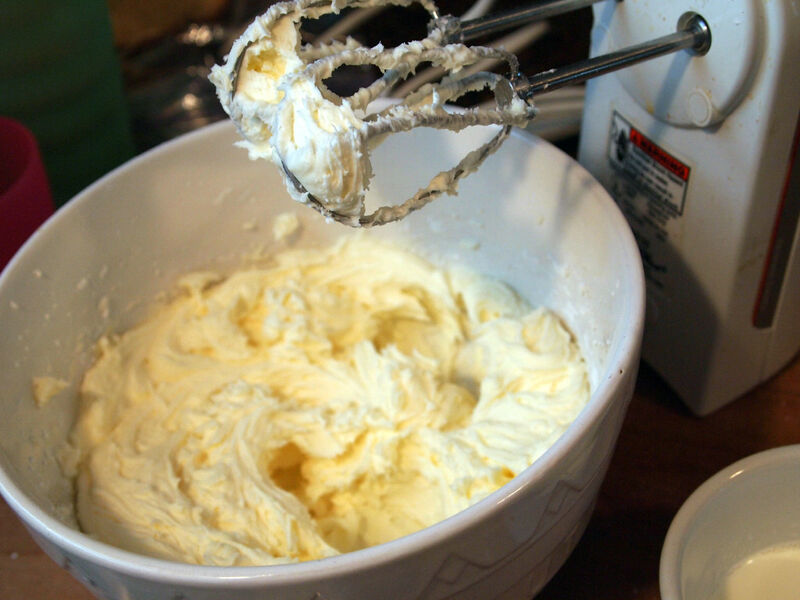 Increase the mixer speed to medium-high, and beat frosting for an additional 3 minutes. Makes about 2 1/2 cups of frosting. This makes a medium consistency frosting, which is very spreadable and creamy. For a thinner consistency to fill cupcakes or sandwich cookies, add about 1/2 cup less powdered sugar. Hooray!! That's great to hear. You are very welcome, Benita. I started using products that aren't toxic and then wanted to start making my own things like frostings and cakes since most pre made stuff have things in them that you can't even pronounce. I tried one chocolate frosting recipe but it was bitter sweet. Then I found yours. I was worried it would be too sweet so I substituted one stick of unsalted butter for salted. But it definitely wasn't it was so fluffy and good! This is easy to make and great for beginners. This was only my 2nd time making frosting and from now on this will be my go to. I have one question. If you ice a cake with this should you refrigerate the cake? I wasn't sure if the icing needed to be refrigerated. First of all, good for you, Nicole! Secondly, good question! You may refrigerate the frosted cake, but it's not mandatory. I do recommend it if it is hot and/or humid in your neck of the woods. Can this frosting be used for frosting a double layer cake? Absolutely, Jen! The recipe yields enough to thinly frost a 9-inch layer cake. For a thicker layer of frosting, double the recipe. Have fun with it! Could you cut the milk chocolate frosting recipe in half, I only have to drost 12 cupcakes. I only had milk chocolate chips (Hershey's), and no way of getting to the stre for bars, so I melted the chips into the cream (ie. made a ganache), and the frosting turned out beautifully. Super tasty! That's great to hear! Thanks for letting me know, Heidi! hi ! your recipe looks great and I would really like to try it.i was wondering if this can be used as a crumb coat for fondant cakes? I'm planning to make white chocolate mudcake and frost it with either chocolate ganache or Buttercream. Yes! You may use the milk chocolate buttercream as a crumb coat base for fondant by preparing the recipe according to the decorator's frosting instructions included in the notes. Then, allow the frosting to crust prior to adding the fondant overlay. I wouldn't put ganache over this frosting, as it will melt the buttercream. Have fun! I just made this. Omg YES! Huge hit! I've used milk chocolate chips for frosting several times without issue. I've never encountered bits and the taste was fantastic. So, milk chocolate chips can and do work! Good to know, Lane! I'm sure that the brand of chips and the amount of wax included in them has a lot to do with your results. Thanks for sharing! Just made this with a little unsweetened chocolate mixed in to balance the sweetness (it's for quite a sweet cake). I only had half and half, but it still whipped up into a milky, chocolate cloud. My newly 7 year old is very pleased. Thanks for sharing. I made a double batch of this frosting last night. And because I already had them and was NOT going back to the store I used milk chocolate chips. Nestlé brand. No problems whatsoever. I made sure to stir them very well after melted until totally smooth. My husband says the frosting tastes like a 3 musketeers bar. It spread very easily and piped like a dream with the suggested addition of the extra sugar. I didn't need it, but people looking for a stabilizer can add a tsp of meringue powder. It's in the baking aisle and even sold in the cake decorator section of craft stores. Your frosting will set very stiffly. I use it when making buttercream decorated cakes in the summer. Michelle, you crack me up! I certainly understand refusing to make yet another trip to the store when I have a substitute on hand that I can try in a pinch. Stirring the chocolate chips extra well to ensure that they are completely smooth is a fantastic tip. The meringue powder tip is also an excellent addition to add stability in the hot summer months. I do the same, myself! Thanks for all of the useful feedback! Sorry, I have a sticky "c" on my lap top, and just realized I typed "muh" instead of "much" in my message. I meant to say - Thank you so much for sharing!! Love It! Absolutely yummy! I made your frosting to top off vanilla mini chocolate chip cupakes I made for a co-workers birthday. Everyone said the frosting was the best they had ever had. I have since, made it three more times - twice as milk chocolate and once as vanilla. Thank you so muh for sharing!! Hooray! I'm so happy to hear of your success, Tracy! Milk Chocolate Buttercream is by far my favorite frosting. I love that you doubled the chocolate. You're a gal after my own heart. Oh ps - I used a Kitchenaid mixer rather than a hand-held only because I happened to have it out. I worried for a second that it might be too powerful for this, since you had so clearly said to use hand-held, but |I was too lazy to dig out another appliance - but the results were absolutely stellar. Thanks again! This frosting is DEMENTED. Usually milk chocolate is not my preferred chocolate but I was making this for a co-worker. This frosting was fantastic. It came together beautifully, was smooth as silk, was very easy to work with and tasted insanely good. Everyone at my office loved it too. I will make this 1,000 times in the future - thank you for this wonderful recipe! Thanks so much, never did understand cups!! Happy baking! You're welcome, Amanda! Happy baking to you, too! OMG, this looks amazing. Thanks so much! Thanks so much! It's a real crowd pleaser. I guess I should apologize in advance to my daycare for the sugary delight that will send her/our children bouncing off the walls in the pure happiness that is sure to go with this plate of cupcakes! Thanks for posting! Ha! That's hilarious, Julia! Apologize if you must, but I'm sure everyone will love you if you bake them cupcakes topped with Milk Chocolate Buttercream. Would this be enough for a 13x9 cake? I'd like to try this, wondering if I should double it (I'm sure I won't have a problem having a few spoonfuls if I make too much). Your recipe sounds amazing and I can't wait to make it. My question is how far in advance can I make this frosting? It's Thursday today, and I need to make 30 cupcakes for a birthday party that's two days from now on Saturday. I'm going to give this a try as a replacement for the icing on my chocolate sour cream pound cake! a gritty texture will come from overheating your chocolate bars & that is very easy to do if you're not used to melting chocolate! Very true--especially when using couverture chocolate. I've also found that a gritty texture can result from not letting the melted chocolate cool before incorporating it with the other, cooler ingredients. Oh, My, Gosh!!! The Best chocolate buttercream I've ever had!!! It was a HUGE hit with the entire family!! Creamy, light and simply delicious!! Thank you for sharing!! You are very welcome, Christi! I really appreciate your feedback on the recipe. Does this frosting work well for frosting the vertical and horizontal surfaces of a cake, or is it only suitable for the tops of cakes/cupcakes? It looks delicious and my BF wants a white cake with chocolate frosting. Oh, absolutely Andrea! I've frosted many a layer cake with Milk Chocolate Buttercream with excellent results. I'm sorry to hear that, Lala. I've never had that experience. 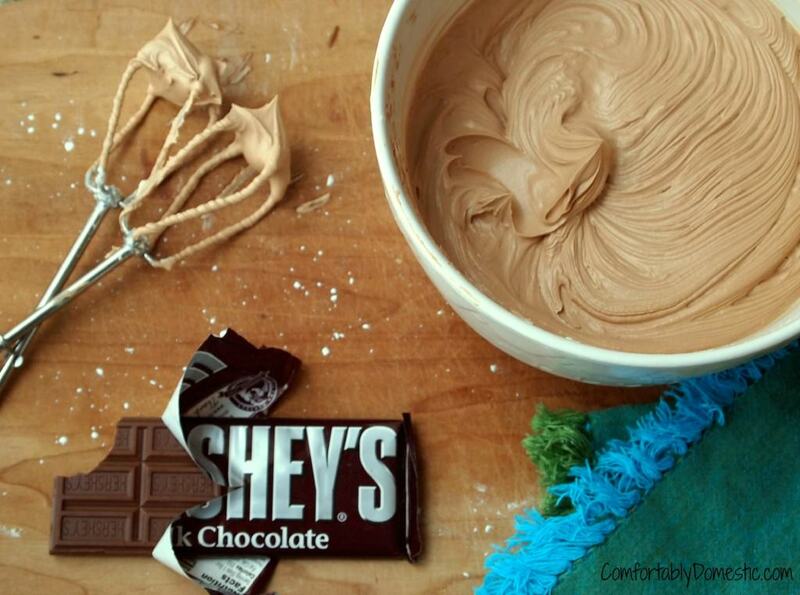 Did you use plain Hershey's bars in the recipe? Chocolate chips will give you a gritty texture. 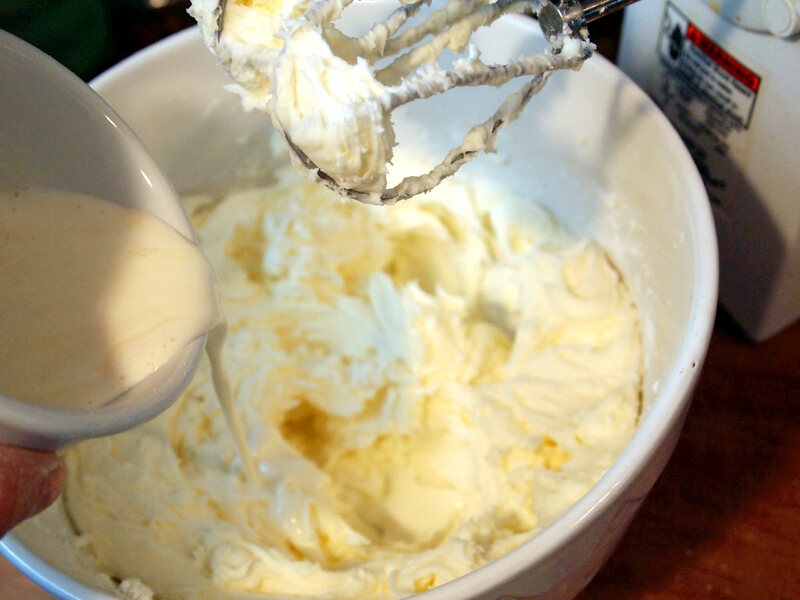 When you make whipped cream if you beat to long, it begins to turn to butter instead of whipped cream. there is a fine line between the two. That is why there was a gritty texture. Can I substitute milk for the heavy cream? I forgot to pick it up at the store. How much would you recommend to cover an 8 inch sandwich/ chocolate victoria sponge cake - filling for the middle and on the top? 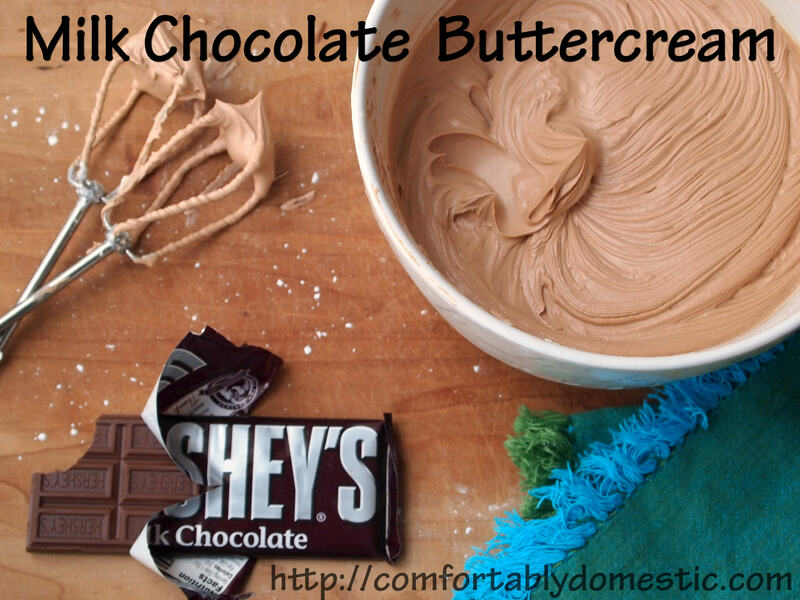 Making my boyfriend a birthday cake this weekend and this buttercream sounds perfect! The recipe makes enough frosting to thinly(about 1/4-inch) cover an 8-inch layer cake. If you prefer more frosting, then I recommend doubling the recipe. Good luck, Rachel! Do you think cadbury's dairy milk will taste as good? Hershey's are a bit hard to find in the UK. Febin, I think as long as you use the Cadburry bar (not morsels,) and if it doesn't contain any wax in the UK, that Cadburry would be a fantastic substitute! Can't wait to try it! It's my baby's first birthday next weekend and I'm baking a 100 vanilla cupcakes. Half of them with your white chocolate frosting which I've tried before and is absolutely divine and half with this! What a great idea! Happy Birthday to your Baby! First birthdays are so much fun. I just wanted to tell you this is the BEST chocolate buttercream i have ever made. So light tastes A M A Z I N G ! ! ! Thank you!! Just made this icing and it us so hard not to keep eating it with a spoon!!! Sorry I meant to say how long does it last before going bad... :) I know regular buttercreams last for a few days, but I've never tried one that had whipped cream in it! Yes uhhuh yup yuppers ok yessssssss. I needed this recipe. Oh, you totally do Mads. Fantastic, Lanthi! I'm usually right with you on the cream cheese frosting front, but sometimes its nice to change it up with a fluffy buttercream. So glad you liked it. My husband requested a milk chocolate frosting for his birthday cake. Since I'm a dark chocolate girl I had to look for a recipe (never made anything with milk chocolate :). Yours looked the best. I put it on a gluten-free yellow cake and everyone loved it! The bonus is that you'd chosen gluten-free chocolate so I didn't have to change a thing. I live with five other girls, and we are all division 1 athletes. I made this buttercream and stepped away to turn over my laundry (was gone no more than 10 minutes) and return to half the bowl gone! Lots of dirty spoons and unfrosted cupcakes at our house. Absolutely amazingly deliciously wonderful! I have been looking for a recipe like this for months!!!! Hey Georgia! Chocolate chips absolutely will not yield the desired results. The reason is this: if you use milk chocolate chips or candy melts, the same waxy coating/additives that help the chips/melts retain their shape while baking, and give it sheen after being melted/cooled will do weird things to the frosting. You'll end up with clumpy, hard bits in the middle of your otherwise creamy and wonderful frosting. For that reason, I would only use the Hershey bars called for in the recipe. You *might* be able to get away with a good quality baking chocolate in equal quantity. I've made this frosting with 60% cacao Bittersweet baking chocolate, with good results. 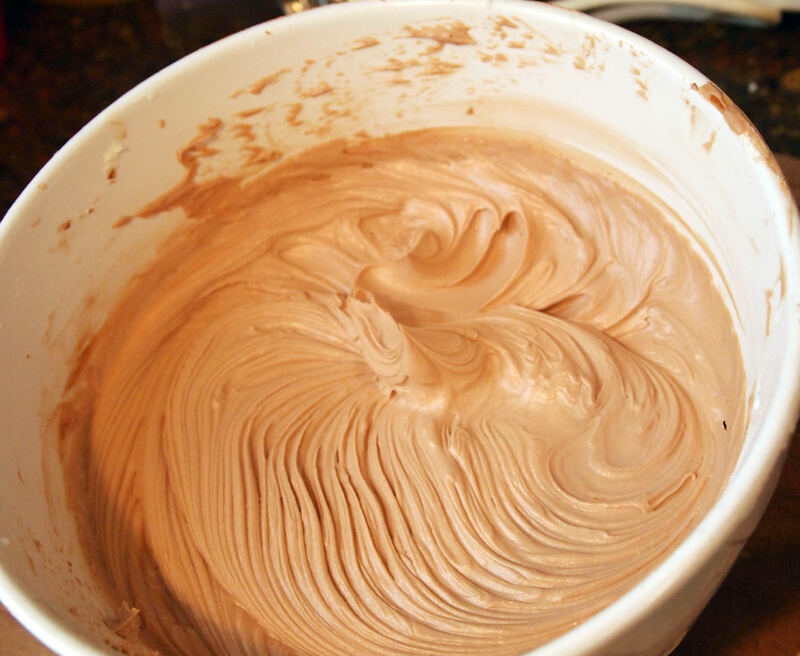 Haa anyone tried making this frosting using dark chocolate candy bars for a a dark chocolate version? I have used bittersweet baking chocolate with 60% cacao with good results. I'm not sure how a darker chocolate would fare. To make this frosting more stable you can soften a packet of gelatin into the cream, heat just until it simmers, and cool before adding to the rest of the ingredients. It will give you great structure, but it will still need refrigeration. For better directions visit foodtv.com and search for Alton Browns chocholate mousse. If nothing else, this completely reinforces and validates my chocolate hoard. Because if there's one thing I love more than chocolate, it's frosting. You are such a giver when it comes to bringing sugar and butter-laden delight to the masses. Please don't stop. How do we adequately express our profound gratitude for your selfless service to humanity?!!! YUMMMMMY! Thank you, dear. You are, indeed, our hero!! Yes, one can certainly be tempted to eat this with a spoon and only a spoon! Thanks for sharing your recipe! Is there a way to make this strawberry flavor? Hmmm...I can't think of a way to make milk chocolate frosting into strawberry. Maybe include some strawberry essence or extract? And thank you for this blog!! Excellent idea, Melly! 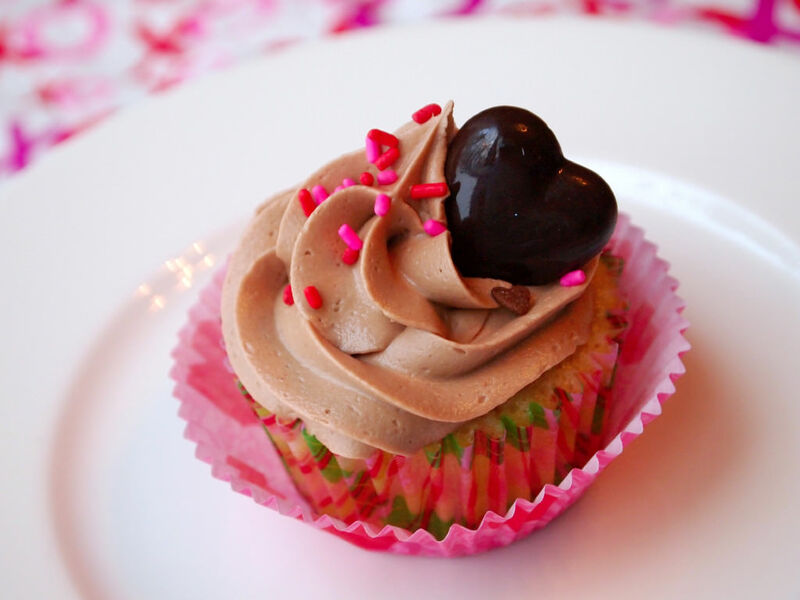 I've added a touch of raspberry extract to the Milk Chocolate Buttercream, and it was lovely. You can buy strawberry flavored white chocolate bars instead of Hershey bars. Pardon me while I source myself a six pack of Hershey bars…thank goodness there will be two leftover for me to devour straight out of the package!